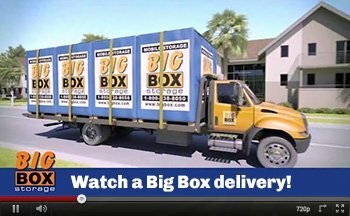 Servicing all of Encinitas, Big Box Storage provides convenient portable storage throughout all of North County San Diego. By having the storage unit (or rather a “Big Box”) delivered right to their address in zip code 92024, Encinitas residents are able to skip the hassle and cost associated with have to rent, load, and unload a truck. There’s also no need to even go to the storage facility as the storage unit is delivered and then picked up right at your Encinitas home or business. Each Big Box generally holds the contents of up to one and a half rooms of household furniture. In terms of dimensions, each one measures 8’x5’x’7. Need additional space? Multiple Big Boxes can certainly be dropped off at your Encinitas address if requested. Note that if you’re trying to determine just how many Big Boxes you might require, feel free to use the online storage space estimator. Additionally, helpful support representatives are also available by calling 858-790-8580. 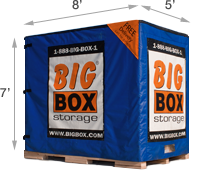 Storage rental rates at Big Box Storage are backed by a 110% best price guarantee. The company will beat the rates of any other storage company in Encinitas (or anywhere in San Diego County) by at least 10%. Other areas within San Diego County include storage in Mission Hills/Mission Valley and storage in Pacific Beach. After the delivery and pickup of the Big Box(es) to and from your address, it will be stored within the company’s secure storage facility in the Encinitas area. If you should ever find that you need to access your possessions while in storage, Big Box Storage is open seven days a week for your convenience. For a general overview and explanation of why Big Box Storage is the top storage solution for Encinitas area residents and businesses, please view the company’s online infographic. Otherwise, to schedule a delivery please feel free to either utilize the online scheduling form or contact a support representative at 858-790-8580 between the hours of 7:30am to 6:30pm daily.